I wrote a blog entry in which a table was the best way to organize some data. I realized the standard, free WordPress editor doesn’t contain a table tool, and tables are cumbersome to create with HTML code. Fortunately, the website Tables Generator helped me create the table for free, and, with minimal editing using the WordPress visual editor, the table appears like I intended. 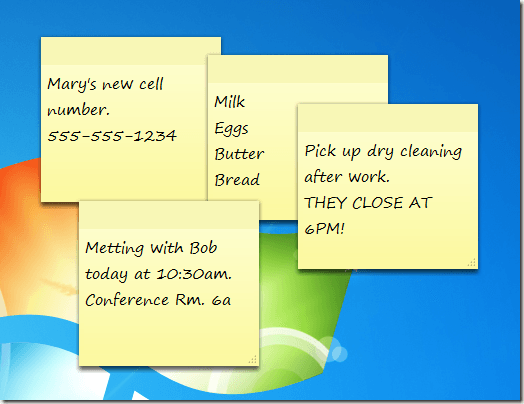 I love Sticky Notes, the application which Microsoft began including with Windows 7. My motherboard died, and I had to get a new computer. 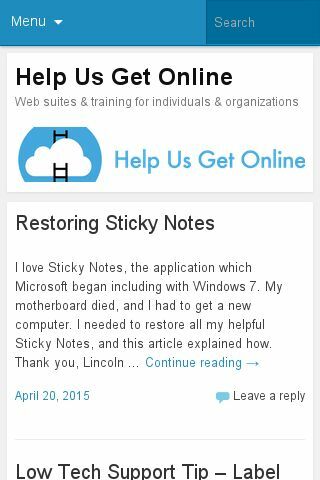 I needed to restore all my helpful Sticky Notes, and this article explained how. Thank you, Lincoln Spector. A client told me he could not connect to the Internet. When I arrived at the house, I saw that the ethernet cable was not plugged into his laptop. I connected the cable, rebooted the computer and, voila, Internet. Later, we unplugged everything and connected wirelessly. I did not think to figure out why he was not previously connecting wirelessly, so I that’s a mistake on my part. But I did do this part right: I put a label on his laptop above the ethernet port, a label on the wireless router above its ethernet port and a label on the ethernet cable itself. I found a playlist I really liked, so I used Amit Agarwal‘s utility to copy it to my personal YouTube channel. Much respect! We conducted the Twitter Basics course with our friend DG, and this is his evaluation. On January 9, 2015, we still have spots left for the last free offering of the Twitter Basics course.